In terms of product policy, TA TOONG WANG adopts ability oriented training and precise quality. The harness and flexibility of products must conform to the certain standards. In order to conform to the certain harness and flexibility standard, the product material, high-class casting iron, is refined with special methods. Most of processing products must be gone through special nitrogen treatment, which will make the surface harness up to HV680 and then be examined by QC department. Only the passed products are packaged and shipped. The strict examination will bring the products to the standards of first-class world level. DTLOY DT-101 DT1 Chrome plating pison rings common standard piston ring material. 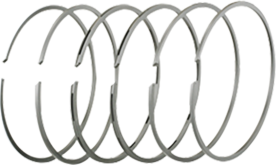 SUPER DTLOY-A DT-201 DT2 Large low speed engine piston rings wear resistant reinforced. SUPER DTLOY-B DT-301 DT3 Pison rings for special alloy cylinder wear resistant reinforced. Especially refined high class cast iron most widely used. Alloy cast iron charact erized for it's heat and wear-resistant. Pb bronze used for piston rings wear-resistant and anti-corrosion.